iPhone 8 comes with a 5.5-inch & 5.8-inch screen, 12-megapixel camera, wireless charging, and 10nm A11 processor. To put it another way, this fresh gadget offers us much more convenience to enjoy our beloved videos on it. However, the new iPhone 8 does not differentiate itself from previous Apple models too dramatically, so it is natural that the new iPhone still supports only a few video formats like MP4, M4V and H.264. Therefore, if you have some other types of videos like MKV, M2TS, FLV, AVI, WMV, etc and want to play them on your new gadget iPhone 8, you could certainly meet with a rebuff as was expected. How to play videos on iPhone 8 freely? Is there any solution? Keep going. In fact, the simplest solution to your trouble is to download iPhone video converter for the sake of encoding video to iPhone 8 supported format. With iPhone 8 emerging, a great many of video transcoders also surface. Just keep a cool head when choosing the software since some may cause the video quality lost, disappointing you a lot during watching. No hurry, there is always a way out. 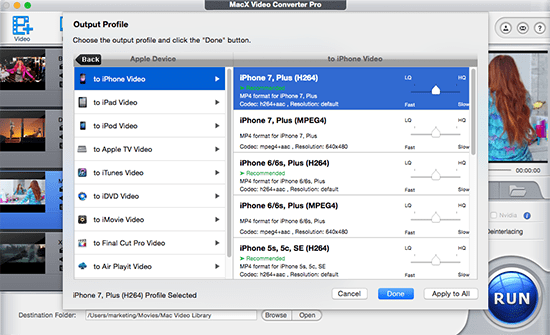 MacX Video Converter Pro comes as the best video to iPhone converter for Apple enthusiasts, helping you decode and encode any videos to iPhone 8/Plus/7s/7/6s/6/SE/5s etc with great ease. Especially designed for Mac users, the program can convert 4K, HD and SD videos including MKV, M2TS, MTS, AVI, MPEG, WMV, etc, to MOV, MP4, M4V compatible with QuickTime player, iMovie, YouTube and so on. What's more, the video converting tool comes with the fastest video conversion speed due to the use of Intel's QSV hardware acceleration tech and retains original quality. Therefore, you can enjoy any types of videos like FLV, AVI, WMV, MKV, etc on iPhone 8 with no worries. Best iPhone Video Converter Download!! Fastest video covnerter for iPhone 8 to convert among UHD/HD/SD videos in MP4, MKV, AVI, MTS etc to iPhone 8 (iPhone 7s/7/6s/6/SE/5s etc), up to 5X faster than others. Download and install the video to iPhone 8 converter on Mac (10.13) or Windows (10), launch this tool, click "Add Files" to load the video you want to convert. Choose "To iPhone" as output format for converting video to iPhone 8 supported video format. Besides, it also provides good solution to convert video to iPad, iPod, MP4, MOV. Tips: This video to iPhone 8 converter also works excellently in customizing stylish videos by a wide range of preset output options and completely personalizing videos by adjusting parameter setting, clipping video segment, removing subtitle, etc. Click "RUN" button to start converting video to iPhone 8. You can view the conversion progress and cancel the converting process at anytime with this iPhone 8 video converter downloaded on your Mac. Note: Besides transferring videos to iPhone 8, this downloaded program also serves as an excellent YouTube downloader, which is specialized in downloading and converting video from YouTube to iPhone 8/8 Plus, letting your enjoy YouTube video on iPhone 8/Plus offline anywhere anytime. If you want to convert video to Samsung, HTC, Surface, etc, or convert favorite video to DVD compatible VOB files so as to burn to DVD disc, you could give MacX Video Converter Pro a try. It will certainly leave you a deep impression. Best software to easily convert videos to iPhone 7 (iPhone 6/Plus iPads Android included) in 1080P, 4K 2160P, 8K 4320P MKV, MTS, AVI etc with top quality and 83 x faster speed. Also iPhone 7 video download in HD MP4 from 300+ sites is allowed. This tutorial shares an excellent YouTube to iPhone converter for Mac to download YouTube videos and transfer to iPhone friendly format with ease. With this YouTube to iPhone converter, you can enjoy YouTube videos on your fashionable iPhone (iPhone 4/4S/5/5S/5C included) anytime anywhere. This tutorial focuses on how to play HD MKV and Bluray M2TS videos on iPhone 8 by converting these videos to iPhone 8 compatible format with the help of a fast 4K/HD video transcoder.